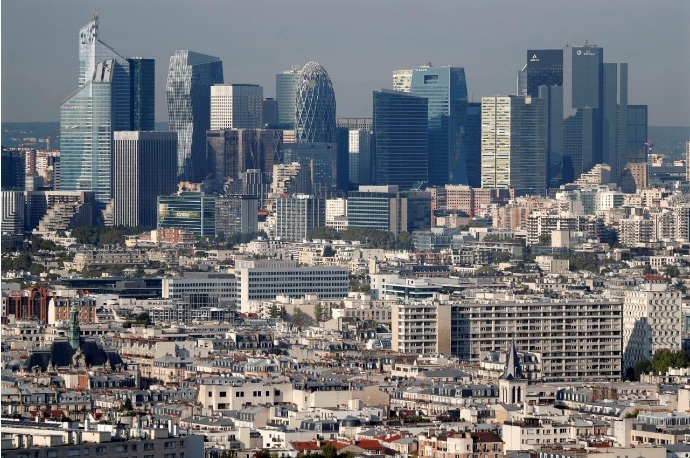 General view of the financial district of La Defense seen from Paris, France, September 21, 2017. LONDON/PARIS - While most London-based bankers are brushing up on their German to prepare for a move to Frankfurt post-Brexit, senior staff at French investment banks expect to say “Oui” to government pressure to bring jobs home to Paris. Most international banks in London have declared where they will move their European business in the event of a “hard” Brexit, in which the UK would give up access to the single market, including financial passporting rights. Frankfurt is by far the favorite. European giant Deutsche Bank, for example, said in April up to 4,000 UK jobs could move to Germany. Although French banks have been wavering about their plans, the bankers who work for them in London believe pressure from the government of Emmanuel Macron, himself a former investment banker, makes a Paris move almost certain. “The Macron administration is really pushing for the French banks to move some of us to Paris, setting up international schools there and talking tax breaks,” said a senior London-based banker at one of the three main French investment banks. “Personally, I am preparing for life in Paris. Unless we get a (soft) Brexit deal, it’s almost inevitable,” he said, asking not to be named because, like others interviewed for this story, he was not authorized to speak to the media. That sentiment was echoed by a second London-based source from another top bank. “Most of the Americans are moving to Frankfurt and a lot of them are very advanced in their plans, so there’s a lot of pressure for us,” he said. A source at France’s finance ministry maintained there was no undue pressure on the banks, but acknowledged the government was keen for domestic lenders to base more jobs in France. “This government is doing a lot in terms of attractiveness like getting rid of the wealth tax. We want the banks to live up to promises they have made, we want them to make a concrete gesture,” one ministry source told Reuters. French banks feel they can afford to wait until the details around Brexit become clearer because they already have EU licenses through their Paris headquarters, unlike their U.S. counterparts which conduct nearly all of their European investment banking business out of London. France’s two biggest investment banks in London, BNP Paribas and Societe Generale, have not set out firm plans, though SocGen CEO Frederic Oudea told Reuters in June it could move 300-400 out of the 2,000 investment banking jobs to Paris. Credit Agricole, the third biggest, has moved its 10-person European government bonds trading platform to Paris, but a source at the bank said the move was not related to Brexit. All three declined to comment. French authorities want to convince the financial community that the sector is no longer seen as the “enemy”, as former socialist President Francois Hollande once called it. “The previous government was an ideological one; this one is pragmatic,” a senior French banker at one of the top three told Reuters in Paris. Banks moving to Germany aim to take advantage of the country’s AAA credit rating, relatively attractive tax regime and strong economic track record. For its part, France has introduced measures to cut labor costs and lower taxation, and has pledged to build more international schools targeted at expatriates’ children. Former Bank of France governor Christian Noyer, tasked by the government to lobby foreign finance firms, has made more than 400 pitches to banks in New York and London in the months since Britain voted to leave the EU in June 2016. One big win has been British bank HSBC, which said it would move up to 1,000 traders to its Paris entity in the case of a hard Brexit. That is the only major international bank so far to say France will be its new EU headquarters, however. Wall Street bank Citigroup said last week it was applying for a license to conduct sales and trading activities in France, but its legal EU headquarters will be in Germany. Noyer has said that even if banks say they are seeking a banking license in Frankfurt, that does not mean most of the jobs will be there. “I know of some people who say ‘I‘m setting up my base in Frankfurt but I‘m putting my trading rooms in Paris in a subsidiary. I’ll create a few jobs in Frankfurt but the bulk is in Paris’,” Noyer told Reuters in June. While most London-based bankers are brushing up on their German to prepare for a move to Frankfurt post-Brexit, senior staff at French investment banks expect to say “Oui” to government pressure to bring jobs home to Paris.